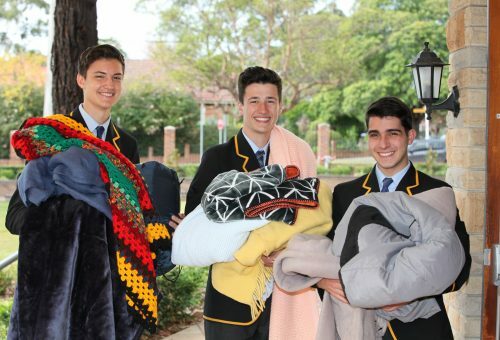 On Wednesday 17 May the College held our annual Winter Appeal seeking blankets, socks, beanies, scarves and toiletries. The generosity of the community was evident as the Chapel became overrun with donations. We collected brand new scarves, beanies, socks and underwear to send out on Night Patrol for those who sleep rough, and the blankets / sleeping bags will be donated to several different agencies who care for those who have very little, particularly in this Winter season. Along with this we challenged each College House to collect specific toiletry items which will later be made into Toiletry Packs at our Winter Sleep Out on July 21. These packs will be given to those sleeping rough – a simple, small touch of dignity in a life that is often overlooked. We thank everybody for their commitment to this appeal. No more items are required, but if you would still like to help you can drop the following items off to Gillian Daley at the College Reception – little packs of tissues for pockets (NOT boxes) and razors for men.